There are some cookbooks that every kitchen should have, and The Joy of Cooking is one of them--for recipes and some darned interesting food facts. Where else can you learn how to bard a pheasant, let alone what that means? (It means to wrap it in bacon to make your tastebuds happy). Or how to prepare a proper partridge, grouse, pigeon, ostrich, emu, rabbit or buffalo. Just in case one turns up someday. Giving credit where it is due, this is a JoC recipe, with only minor modifications. It's a quick and simple 3-bowl recipe (wet, dry and streusel). And don't be alarmed by the use of fresh cranberries--their tartness mellows in the baking. 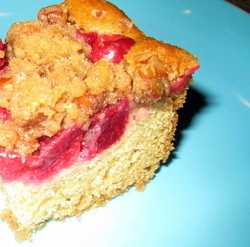 The "thick-fluffy" texture of the cake and the sweet-crunchy of the streusel balance the fresh cranberries. It's an opposites-attract texture/taste party. Mix everything with a fork or dump into the food processor until it's the consistency of coarse, damp sand. Mix dry ingredients together (flour, baking powder, baking soda and salt). Mix sour cream and vanilla together in a separate bowl. Cream butter and sugar together til light and fluffy--best to use a mixer for about 3 minutes. Add the eggs, 1 at a time. Then take turns adding dry and sour cream mix. Start with dry and add everything in 3-2 (dry, sour cream, dry, sour cream, dry). Pour into a greased 9" x 13" pan. Sprinkle cranberries over the batter. Sprinkle streusel over cranberries. Bake at 350 degrees for about 45 minutes.